Flip through the pages of any interior décor magazine these days, and the chances are you will see a tall plant, with large leaves, being used as an accessory to the latest furniture or wall finishes. 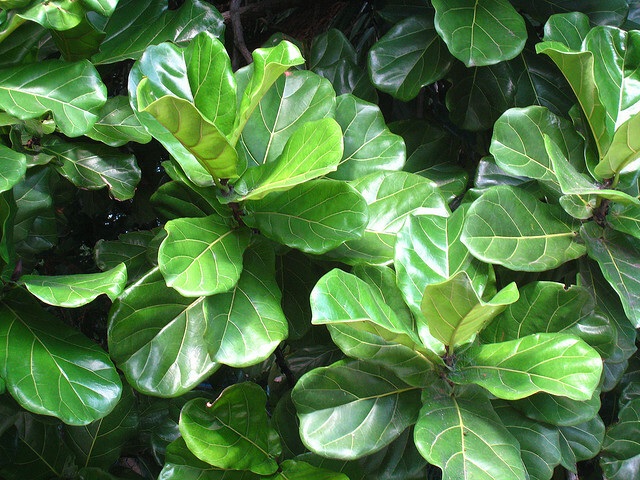 This plant – the Fiddle Leaf Fig – has captured the imagination of decorators for its bold foliage and clean lines. The leaves in this plant can be 18 inches long, and they usually have a slight ‘waist’ before bulging out into a rounded end. The overall shape is like the body of a violin, which is why, of course, this plant has an instrumental name. Easily grown indoors with some basic care, this plant does best in bright light, with or without any direct sunlight, and its thick, leathery leaves with slightly wavy edges look terrific against white or pastel walls, and with simple modern furniture. It looks just as good among antiques and colonial decoration too, and in fact this plant is among the most useful and versatile of indoor trees. It will grow over 6 feet tall, with several upright branches, and it can also be kept pruned to a lower height. The Fiddle Leaf Fig also has a fascinating and exotic natural history. It occurs in dense jungles in a small area along the coast of West Africa, from Cameroon to Sierre Leone. Any seedlings would struggle on the jungle floor, in deep shade beneath the towering trees, and this tree belongs to a fascinating group of fig trees that have evolved a mechanism to overcome this problem. The group is known as the banyan figs, and it includes the famous tree under which the Buddha sat and became enlightened. That was the Indian Banyan, but there are many other banyan species of figs, including some that grow naturally in Florida. What makes banyan figs fascinating is the way they develop. A seed arrives by accident – perhaps dropped by a bird eating the fruit – in the upper branches of a forest tree. There, in the humid conditions and leaf debris, it germinates and begins to grow. Up high it has the light it would lack on the forest floor, and grows for a time as an epiphyte, the name given to plants that grow up in trees without roots in the soil. Most epiphytes are small, but banyan figs grow large, and the young tree lowers roots down until they reach the ground. As the tree grows and expands, it eventually envelops and kills the host tree, giving these plants the alternative name of strangler figs. Over time the tree grows large, and Fiddle Leaf Figs outdoors can reach 30 to 40 feet in height, even when planted directly into the ground. If you are lucky enough to live somewhere without freezing temperatures in winter, then the Fiddle Leaf Fig makes a terrific outdoor shrubby tree, with many upright stems topped with those impressive leaves. Outdoor trees also produce figs, although these are not edible. The fruits of figs are as exotic as the life of the tree itself. They consist of many tiny flowers that remain enclosed in a special structure called by botanists a syconium. These flowers are pollinated by tiny wasps, called fig wasps. These use the inside of the fruit as food for their larvae, but when a female emerges, she carries pollen from her own fruit to a new one, where she simultaneously pollinates the fruit and lays more eggs to continue her own life-cycle. The syconium then develops into the fig itself, familiar in general form to us all from the edible Brown Turkish Fig. While caring for your Fiddle Leaf Fig you can reflect on its extraordinary biology, watering it thoroughly whenever the top inch or two or soil becomes dry. Always water thoroughly until the water flows a little from the drainage holes, and of course always use a pot that has those very necessary openings in the base. Empty the saucer once you have finished watering your tree. If you have somewhere outdoors to keep it, then it will enjoy the warm weather, and grow well during its time outside. Move it outside – and back inside again too – when the outdoor night temperatures are close to your indoor temperature, say within 5 degrees or so. Place it in a shady place and try to match the light levels to those indoors. Your tree can be gradually exposed to brighter light, but then slowly return it to shade before bringing it in again in fall. A sudden change in light levels may cause leaves to fall. Be careful when handling your tree not to damage the leaves, as the sap can burn the skin. It can also burn the foliage, causing brown and black spots which disfigure the attractive leaves. There are some pests that may attack your tree, such as scale insects and mealy bug. These can be controlled by cleaning them off the stems with a Q-tip dipped in rubbing alcohol – or vodka! Placing your tree outdoors will also allow birds and friendly insects to control any pests on your tree. Grown indoors or out, the Fiddle Leaf Fig is an easy-care plant that brings a distinctive and stylish look to any space, and it will definitely become a family favorite in every home.